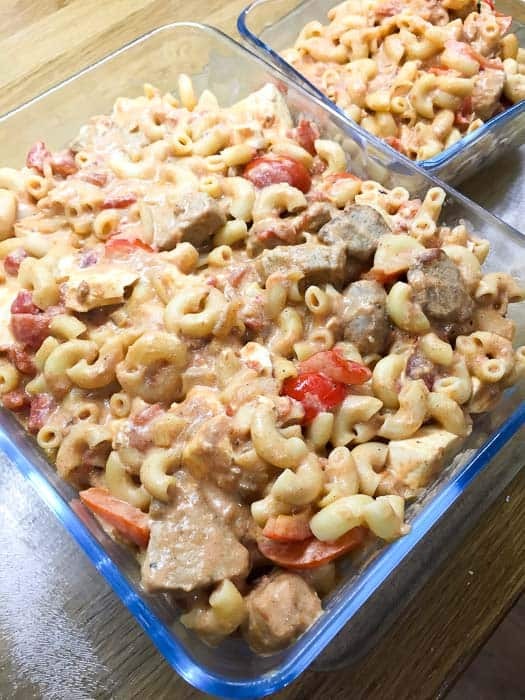 Comforting Pork and Paprika Goulash Bake combines the sweet and spicy flavour of goulash with premium pork fillet, creamy queso fresco, yogurt and pasta in a prepare ahead bake that’s filling and comforting for those days when on only carbs will do! 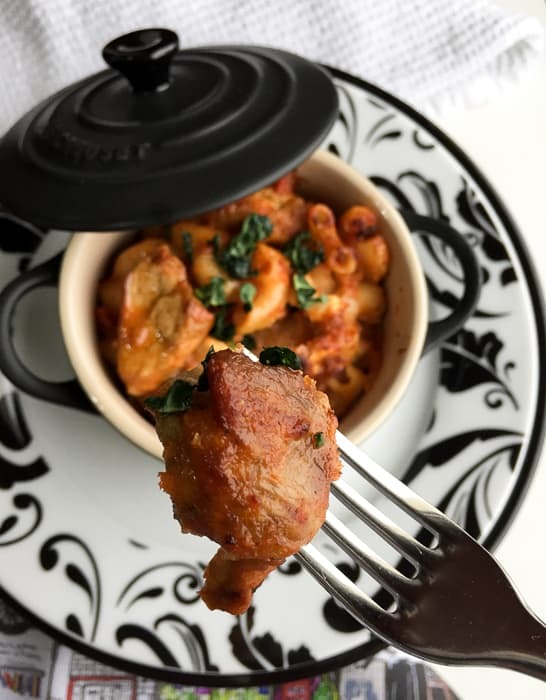 For the Pork and Paprika Goulash Bake I used Pork Fillet Medallions from a new range of British pork raised without antibiotics from The Black Farmer – a UK first for fresh pork products. Leading the way in being the first mainstream brand to introduce the produces, The Black Farmer has worked closely with partner farms to establish farming and production methods in response to the rising resistance to antibiotics. 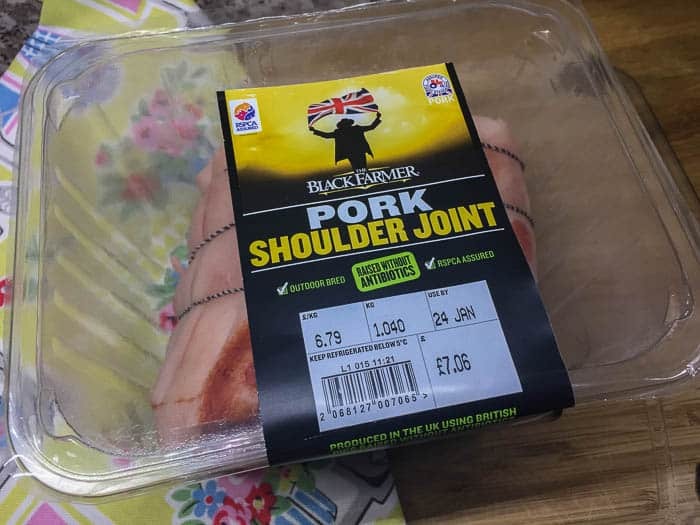 The selection of fresh British pork cuts from RSPCA assured pork can be easily identified by the blue Antibiotic Free swing tag. The unique farming method means that the sows are free to roam outside and are fed on only vegetarian feed. The system guarantees that piglets are born outdoors and reared without the use of antibiotics from birth. Such a high level of welfare means that there is a consistent supply of healthy, natural pig meat from happy pigs. And happy pigs means happy tummies! 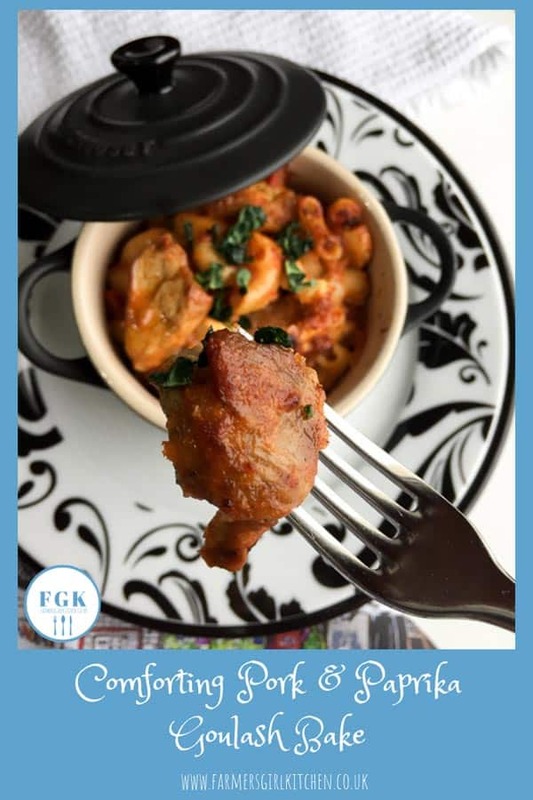 The sauce for Comforting Pork and Paprika Goulash Bake is made in one saute pan. The red bell pepper, onions and garlic are cooked gently, then set aside. The pork is dusted with flour and hot smoked paprika and browned, and the queso fresco gets the same treatment. The queso fresco adds a lovely creaminess to the dish, but you can make the recipe without this ingredient. 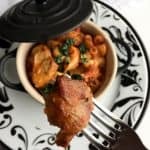 If you want to make the Pork and Paprika Goulash Bake without the pork, perhaps for a vegetarian, then you can use only the queso fresco or you can make the sauce then take some out and have one pan with pork and one with queso fresco. Once you add the stock and tomatoes to the pan, the flour on the pork and queso fresco will start to thicken the stock. 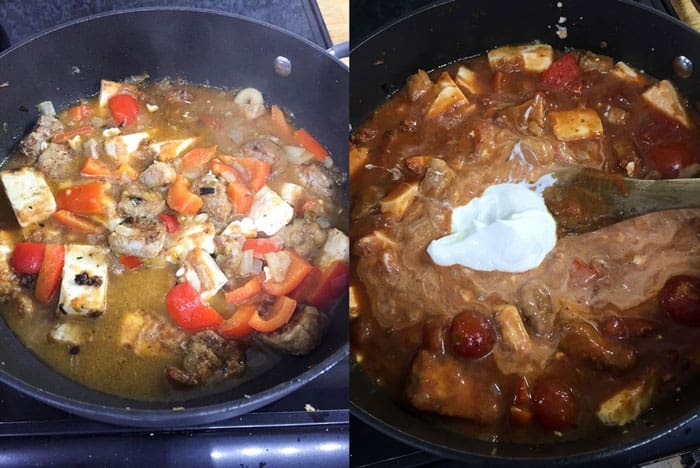 After simmering gently for about 20 minutes, mix the yogurt with a little cornflour so it doesn’t split, and gently stir it into the sauce, simmer gently for 5 minutes. Add the sauce to the cooked pasta, I used elbow macaroni, however, any short pasta would work in this bake. Pile the mixture into a buttered ovenproof dish until you are ready to bake it. 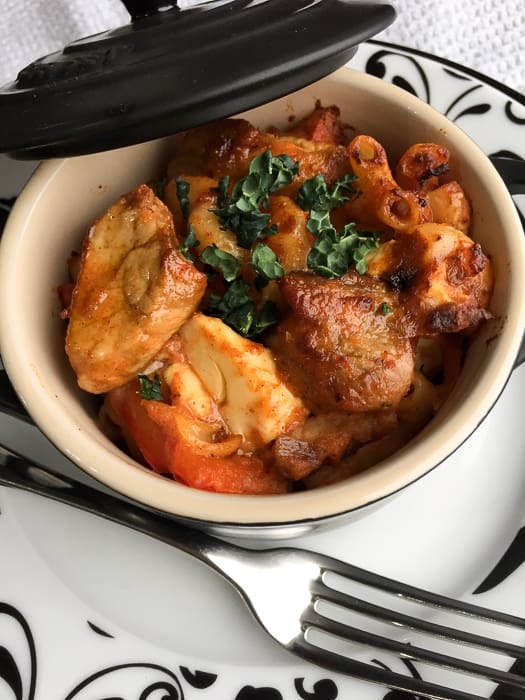 Once baked, the Pork and Paprika Goulash Bake forms a crisp top while underneath the pasta and sauce remain creamy and soft. Sprinkle with parsley or finely chopped kale before serving. A comforting macaroni bake with the warm and spicy flavours of a pork goulash. Cut the pork into 2.5 cm cubes. Put the flour in a plastic bag and season, add the paprika. Add the pork to the bag and toss in the flour until coated. Turn the heat down to medium and add the final tbsp of oil, slice the quesa fresca, toss in the flour and fry gently until golden. Add the pork and vegetables back into the pan. Cook the macaroni in boiling salted water. Add to the pork mixture, taste and adjust seasoning. Mix the cornflour with the yogurt and add to slowly to the pan, stirring gently.and simmer for 5 minutes. Mix the sauce and the pasta then pile into a heatproof dish and bake at 180 C for 30 minutes. Garnish with parsley.or finely shredded kale. 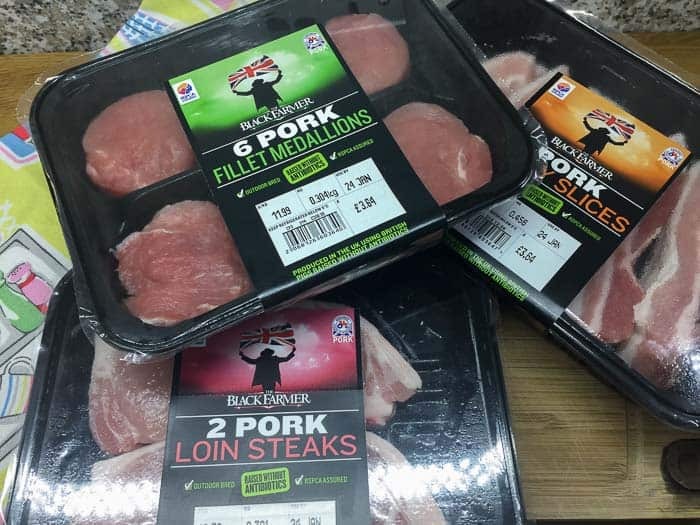 During this winter season of cosy nights in, enjoy cooking up a storm with The Black Farmer range comprising Shoulder Joint; Fillet Medallions; Loin Steaks; Loin Chops; Belly Joint and Belly Slices. Disclosure: I was not paid for this post and all opinions are my own. Oooh yes, love the look of this. We don’t cook with pork enough in my house! 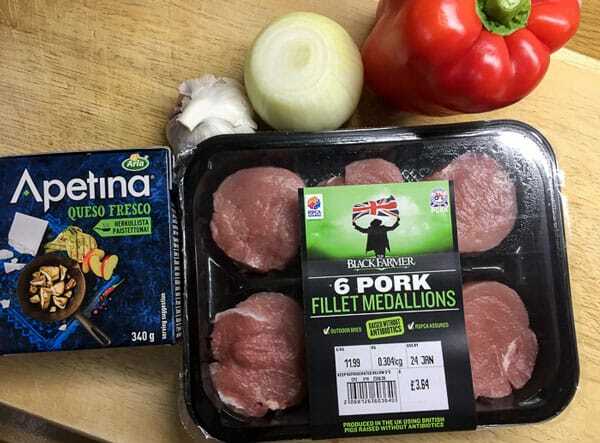 We don’t usually eat a lot of pork either, it’s so good to know that this pork is antibiotic free and RSPCA approved care standards – and it tastes pretty good too! This looks absolutely LUSH!!!! I love a creamy pasta dish at this time of year… you really can’t beat it. Thanks Katie, it was very good and there was plenty to reheat for another day. This reminds me of the amazing food I ate in Slovakia. I really need to try and make it myself, as it’s proper comfort food. Thanks Dannii, that’s really interesting, I had no idea I had created a Slovakian recipe! Wow this does look comforting. Warming and tasty at the same time. Can’t go wrong. I haven’t had a dish like this for years! Thanks Ceri, we do love a pasta bake.